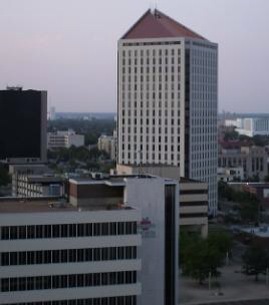 The tallest building in Kansas is the Epic Center, located at 301 North Main Street in Wichita. It stands 320 feet tall and has 22 floors. The modernist high rise was constructed in 1987, in an effort to attract businesses to the downtown area and bolster the local economy. The Epic Center has a white and light orange concrete façade. In May 2014 Kansas will become home to the worlds tallest and fastest waterside. Schlitterbahn is not yet releasing the exact height of the slide yet but says it will be equivalent to 17 stories. Going solely off of stories that puts the 264 step Verruckt slide taller than the tallest building in 4 US states; Wyoming, Maine, South Dakota and Vermont. Once they verify with Guinness book of records that this slide is taller than the 164 ft tall slide in Brazil they will make public the actual height and it will be interesting to compare to the tallest building in each state. The tallest structure in Kansas is actually KWXH Tower in Burrton, a communications tower measures 1501 feet high but that is not counted as a building.